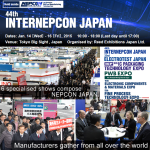 Japan IT Week is truly Japan’s largest trade show where you can find any kinds of latest IT technologies/solutions. A great number of information systems manager, management executives, sales managers, system integrators and managers from IT system division will visit Japan IT Week to conduct business face to face with exhibitors. Japan IT Week is the absolute meeting point for both IT solution providers and IT system managers. Japan IT Week is truly Japan’s largest trade show where you can find any kinds of latest IT technologies/solutions. A great number of information systems manager, management executives, sales managers, system integrators and managers from IT system division will visit Japan IT Week to conduct business face to face with exhibitors. Japan IT Week is absolutely meeting point for both IT solution providers and IT system managers. Silicon Valley Fukuoka Connect is a networking event designed to build connections among professionals in Silicon Valley and introduce exciting businesses and technologies from Fukuoka, Japan. Speaker: Sean Nishikawa, CEO, Trial Retail Engineering Inc.
Sean will discuss an Android-based mobile solution for retail store employees that enables better labor efficiency and better communication. He will also discuss big data from a retail perspective, focusing on computing and analytics as enabled by SMART technology.